To have this delicate dish in perfection, the lettuce, pepper grass, chervil, cress, &c. should be gathered early in the morning, nicely picked, washed, and laid in cold water, which will be improved by adding ice ; just before dinner is ready to be served, drain the water from your salad, cut it into a bowl, giving the proper proportions of each plant ; prepare the following mixture to pour over it ; boil two fresh eggs ten minutes, put them in water to cool, then take the yelks in a soup plate, pour on them a table spoonful of cold water, rub them with a wooden spoon until they are perfectly dissolved, then add two table spoonsful of oil ; when well mixed, put in a teaspoonful of salt, one of powdered sugar, and one of made mustard ; when all these are united and quite smooth, stir in two table spoonsful of common, and two of tarragon vinegar ; put it over the salad, and garnish the tops with the whites of the eggs cut into rings, and lay around the edge of the bowl young scallions, they being the most delicate of the onion tribe. In this recipe we see how important it is to read the whole thing before beginning the process. The boiled eggs need to be shelled carefully for after removing the ‘yelks’ the whites are reserved to decorate the finished plate with rings formed with the halves. Randolph’s recommendation of ice to cool the water for holding the clean greens is one of the best indicators of how elite her kitchen was; an ice house holding ice in the mid to late Virginia spring was an architectural feature seen only in home of the prosperous. She called for powdered sugar which for her meant well pounded lump sugar. I just use regular sugar with no problem. Her made mustard is close to a fine Dijon and the oil means olive oil. Pepper grass would be watercress or one could use a spicy arugula. You can make your own tarragon vinegar by steeping cuttings in good cider or wine vinegar for a few days. Be inventive with the greens but stick strictly to the dressing and you will have a truly wonderful treat. 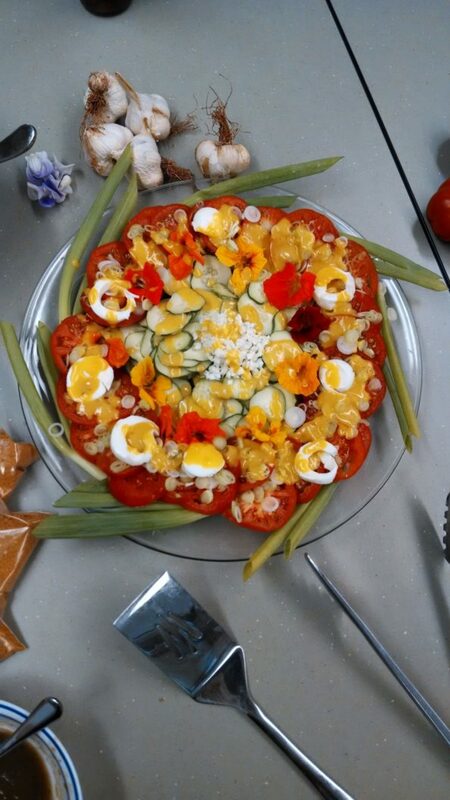 As for the cooks in Randolph’s kitchen; this is a salad to be prepared just before dinner was served. That likely meant that the head cook did not prepare this dish, it would have been turned over to the most experienced scullion with the cook checking on the process.